The Coton de Tulear is a delightful breed. Cotons are sturdy companion dogs, with wonderful temperaments. The breed is an “overall healthy dog” and is considered to be hypoallergenic. But…there is a “caveat”… to insure that you do “indeed” purchase a pure bred Coton de Tulear, that exhibits all of the marvelous traits you are expecting, great care and attention to breeding must be paramount. The public is becoming more aware of this breed and as their popularity increases, dedicated Coton fanciers are concerned that more of our beloved breed will fall into the hands of unscrupulous backyard breeders and puppy mill operations. COTONS AGAINST PUPPY MILLS was formed by a group of Coton de Tulear fanciers, committed to taking action to protect the breed we love. But our concern doesn’t stop with our own breed. It extends to all breeds of dogs who suffer this horrible existence. Protect against what, you ask? Our goal is to protect the Coton from the suffering and inhumane treatment that dogs endure in puppy mills and unscrupulous backyard breeding situations. Where do you think that cute little puppy in the window came from? It came from a puppy mill or, perhaps, a backyard breeder. ABSOLUTELY NO REPUTABLE BREEDER would sell their puppies to a pet store! Is that cute little puppy in the window REALLY A COTON DE TULEAR? More than likely NOT! That cute little puppy can be a mix of any white dogs that resemble Cotons! Your expectations of what a Coton should be will never be fulfilled by a PET STORE COTON! Why will this happen to the Coton? Are they in puppy mills already? DO YOU KNOW ABOUT THE CONDITIONS AT PUPPY MILLS? Dogs live in filthy, cramped wire cages for their entire lives. Their paws never feel grass or solid ground. They are never allowed out to run and play. The dogs are so horribly matted it would be impossible to know the breed. Their nails are long and dig into paws causing severe pain. Their teeth are rotted and their eyes and ears have severe infections. Very often there is no heat or air-conditioning in a puppy mill. Dogs are left to fend for themselves in open cages. Water freezes or evaporates during temperature extremes and many die from lack of water alone. The dogs freeze in the winter and die of heat stroke in the summer. Puppies "cook" on the wires of the cages in the summer. To keep profit up…mill dogs are feed the absolutely worst quality food possible. Often sweepings from the floors are added to their food. Their teeth rot and their jaws rot away because of tooth decay. Dog in mills receive no veterinary care. Mill owners frequently even perform surgery!!! Dogs in puppy mills are debarked often by ramming a steel rod down their throats to rupture their vocal cords. Many injuries occur due to the terrible cramped conditions there. Dogs who live in such tight conditions, fight and can suffer severe injuries that are left untreated, only to turn septic and end in death. Puppies and dogs can get their legs caught between the wire on the bottom of the cages. The miller will cut the leg off of a dog instead of cutting the wire, or that leg often gets “chewed off” by the dogs living in the cages below. Females are bred on their first heat cycle and every cycle thereafter until their bodies are worn out and they can no longer reproduce. When dogs are no longer of use anymore, they are killed. They are shot, bashed on the head with a rock, put into freezers or gassed in some makeshift way. Sometimes they are sold to laboratories or just dumped somewhere. This is often by the time they reach five years old. ARE YOU WONDERING HOW SO MANY ARE SOLD IN PET STORES? Puppies usually are taken from their mother when they are 5 to 8 weeks old and sold to brokers who pack them in crates for resale to pet stores all over the country. The puppies are shipped by truck or plane and often without adequate food, water, ventilation or shelter. They may endure days of long drives while sitting in their own waste. Many die along the way. Pet stores often tell customers that their puppies come from local breeders or quality breeders. Don't believe them, ask to see the paperwork. Find out where the puppies really come from. NO REPUTABLE BREEDER WILL SELL THEIR PUPPIES TO A PET STORE. 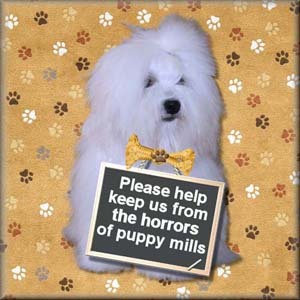 Please help us protect the Coton de Tulear and stop this cycle of misery and greed! A vicious cycle begins when puppies are sold to pet stores or to unsuspecting buyers. The monetary reason for these people to continue to breed begins. Once purchases from pet stores stops, the cycle of pain and suffering endured by dogs in mills and just as poorly cared for smaller situations, ends! No reason exits to continue this most abhorrent treatment of animals because there is no profit to be made! NO PROFIT = NO PUPPY MILL MISERY ! DO NOT BUY YOUR PUPPY FROM A PET STORE! Please purchase your Coton de Tulear puppy from a responsible breeder. Please take all of the right steps possible to insure that you do, indeed, purchase a Coton de Tulear and not a combination of any white dog that comes close to “looking like the breed”. Perform your “due diligence” and seek out a reputable breeder until you feel comfortable that the puppy who joins your family will be happy and healthy and will fulfill all of your expectations of the characteristics of our wonderful breed. Visit our responsible breeder vs backyard breeder page! That page will be of great assistance to you in your search for the perfect Coton puppy. Purchase your puppy from a responsible breeder who has done all in their power to insure that your Coton de Tulear will have a happy, healthy, long life as one of your family members!